Reality is an important topic in photography and it is discussed almost endlessly. It’s a fascinating and divisive subject amongst photographers. It’s also incredibly complex to discuss, full of perceptions and blurred lines. “What is real?” is an intrinsically difficult question to answer and only becomes more difficult when placed in a photographic context. In fact I have written draft blogs on the matter several times only to start afresh. This time I am writing because I’m frustrated and I’m writing because I just can’t sit quietly anymore. First let me share a few honest personal opinions. I believe that compositing a sky into a photo because the light wasn’t good enough is lazy or misled. I believe stretching mountains artificially to make them more dramatic is shallow or misled. I believe faking scenes without explanation shows a disregard for its effects on photography as an art form and is selfish or misled. There are photographers prepared to return again and again to get the kind of conditions others choose to create in Photoshop. These ‘purists’ graft for their art and should be admired and it is part of the art of landscape photography and connecting to nature. Also understand that when I am discussing photographic manipulation I am talking about images that present themselves as photographs, images of flying elephants and other surreal images are not part of the debate. That is a different kind of art that has its own place. Please read this blog in the context of my bias and in the full knowledge that I DO MANIPULATE MY PHOTOS, and that I sometimes PROCESS HEAVILY. I am no saint, but my photos are real and I would stand behind every one of them. Lastly I know that people will read this and say that I am putting people down because I lack the talent, I’m jealous, arrogant, ignorant, bitter, a hater, a troll etc etc but I like to think that I am writing because I actually care about photography itself and what this all means for us photographers as a group. I asked a 60 year old friend about his expectations of how real a photograph is and he said “You said something the other day about moving mountains, that’s f**ked, that’s not real”. Mike is like most of the people I know. He understands that photographs can be edited, he expects contrast and saturation changes but draws the line at physically manipulating content: “That’s the reason why I don’t like pictures anymore, you can’t trust them anymore. There’s no reality anymore to pictures, if you start changing the picture, just go paint the f**ing thing”…”Don’t take anything away because you’re stealing what was there. When you’re lying to somebody about what was there… that’s not on.” I think Mike’s thoughts are pretty clear. But ‘AHA!’ I hear the manipulators shout. “Mike isn’t a photographer, he doesn’t understand! Wide angle lenses distort the landscape, so we can distort them creatively! Why not use the perspective manipulation of tilt-shift lenses to exaggerate mountains in camera!? And if that’s okay then why not do it in Photoshop?” So maybe we can’t make rules, and I certainly don’t intend to make any. But Mike’s opinion matters, and it matters because he doesn’t understand photography, not in spite of it. In defining photography maybe we should instead ask: ‘Is this image real?’. If you can answer “Yes!” it’s a photograph. You can say yes with caveats of course, “yes it’s real but I boosted the contrast”, “yes its real but it’s a long exposure”, “yes its real but it’s an exposure blend to capture the tonal range of the scene”. But if you are saying “yes it’s real, but by the way I just pasted the sunset in and made that mountain 1000m higher” then you have a grave misunderstanding of what ‘real’ means. I have never spoken to Ignacio, but he sounds like an honest bloke and if I asked him the above question he would probably answer ‘no, it’s not real’ with respect to some of his images. But when I look through his portfolio I notice there is no note saying “WARNING: THIS PHOTO IS A MANIPULATION AND NEVER HAPPENED”. There is a very obvious reason for this, aside from a note like that being somewhat ludicrous, it would also negatively impact people’s enjoyment of the image. Whilst some of his images have the tell-tale signs of being faked, Ignacio is very good at Photoshop and I have no doubt people believe in his images. People can look at a scene that is created artificially and be filled with a sense of wonder as if it were real. These images are cashing in on reality, cashing in on photography as a believable medium. This is where the problem is; if you present any photo that looks real there is an assumption that it represents reality very strongly. At least that was the assumption. If you present a composited photo without making any mention of the compositing it creates an assumption that the image content is real. It is a lie by omission, deliberately misleading. It is the photographic equivalent of “The Boy Who Cried Wolf!”. This time it’s The Photographer Who Cried “Truth”. At the moment people will look at a photo and believe it, then find out later that it has been faked. Then they will look at another photo, believe it, and then find out it has been faked. It will continue in this way until people start questioning an image first and believing it second. Then eventually people will start to assume that fantastic images are not real at all. The thing is Ignacio is entitled to process his images, as is any other photographer, I can’t stop them, it is art and they are artists. In fact I don’t even dislike photo manipulation, it can be very creative. Unfortunately I also remember walking into Peter Jarver’s Gallery in Cairns, Australia in 2003 when I was 16 years old and being totally amazed at both the standard of photography and the natural world itself. Those images were pure magic to me, it was a revelation, they inspired me and I wanted to capture the world in the same way. Perhaps the next generation will grow up with manipulation so pervasive that photographs are assumed as works of art and nothing more. And reality is more. What a tragedy it will be when people stop believing photos. Written by alexnail, posted on 26th May 2015 at 5:47 pm, in Articles, News. Permalink. RSS feed for this post. i VERY VERY VERY much agree with this post Alex. Completely. It’s a tricky one. I come from doing a degree in architecture where we were actively encouraged to play with the combination of narrative and fiction on a conceptual basis. All walks of art are expressions of creativity and I am all for people pushing the boundaries. I do howver agree with the dishonesty of some photographers who push it too far. This does Impact on those who use photographic, in-camera techniques to create dramatic images, I remember a funny scenario where I was showing someone one of my images from Norfolk of a very rich golden sunset. I actually did next to no post processing but my friend just didn’t believe me, assuming it was ‘photoshopped’. I don’t think photography is the only medium to suffer this fate unfortunately, as I’m sure you will agree. I do think this is where the effort comes in to play however. Without meaning to blow smoke up your proverbial, I have always acknowledged your hard work and effort finding locations and creating compositions. That i feel is worth more than any post processing can ‘claw back’. Lets hope viewers will remain receptive to this fact! Alex, interesting read, completely agree, to the point that I think it should be labeled as separate entity, i.e. ‘art photography’ or suchlike. My personal experience of photography is to create as much as possible, a facsimile of what is in front of me, if that means a bracketed shot to recreate the dynamic range, then fine, but to add an artificial sky or even a previously captured sky to the image makes it artificial and therefore not photography. I also believe that those who manipulate their images as such are, in fact, missing out on another crucial aspect of photography, the thrill of the chase. Out of breath, striding upwards to a peak to catch the light in time. Hi Alex, and those commenting – thanks for your reply and glad this is generating some interesting discussions. 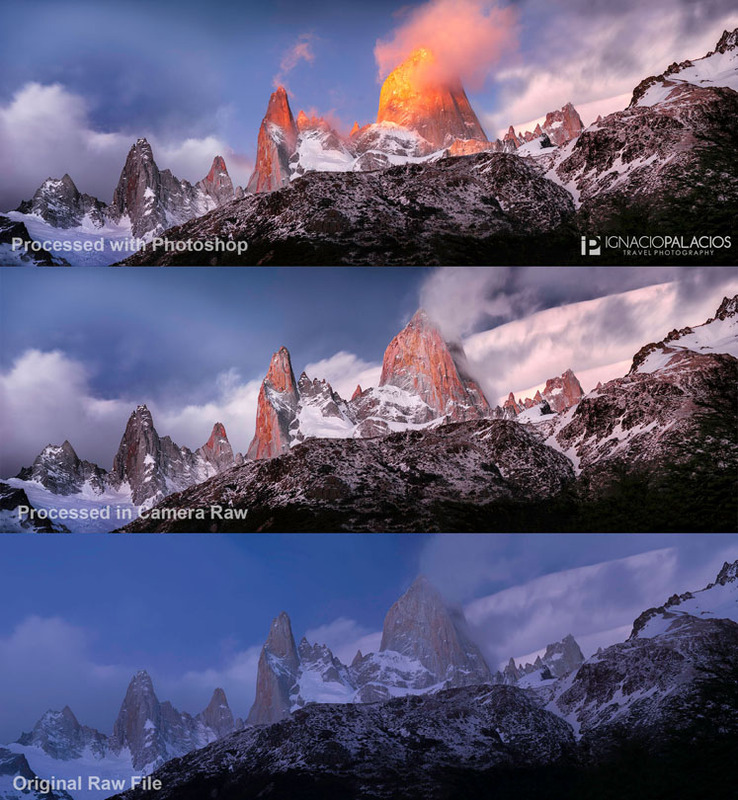 — As I have explained to Cyril previously those clouds in Fitz Roy were there, I did not move the tripod for a while and captured different moments and exposures and merged the bits I wanted in Photoshop.. So that particular image is actually quite real (from my point of view). Having said that, I have no issues with adding a sky that I have captured in another location in the same area. I don’t add a sky taken in Hawaii in an image of Patagonia for example. But sometimes, and only sometimes when I feel that doing so is going to significantly improve the image I do so. I did that in my image of Uyuni (foreground taken at sunset and background at sunrise) or I might move clouds a bit to help the composition etc. And yes, I agree this can’t be called photography. Digital art, or art photography, but I love doing it and I don’t hide it. Why should I hide it? – Thanks again Alex nice meeting you. Sir if I were to sit down and write an article I couldn’t have written it better myself. I wholeheartedly 101% agree with you. I do find my processing ethics expand a little over time. I will emphasise an image in much the same way you did with your first example. But those who flip out skies; I call them ‘faux-tographers’ are damaging landscape photography as a medium. The first guy to reply, Mike, commented to say he’d taken a golden sunset that was assumed to be photoshopped. And that’s the problem, the ‘faux-tographer’ ‘cartoon-ographers’ have caused doubt over any impressive landscape image. On the rare occasions when a sky has been flipped and looks really good I have to wonder why the graphic designer – I can’t call them a photographer, much less an artist – doesn’t stand by his processing skills and explain what they did. If they’ enjoy flipping skies then they should be proud enough of their skill to admit it. But no they prefer to get the adoration of drooling fans suggesting ”You’re an amazing photographer”. As you mentioned flying elephants do not need explanation but a foreground taken at sunset and background at sunrise does. It’s a sham and as soon as I hear people do it without explanation I lose all faith in that persons skills no matter who they are. The fake double rainbow crowd get caught in the end. Sir if I were to sit down and write an article I couldn’t have written it better myself. I wholeheartedly 101% agree with you. I do find my processing ethics expand a little over time. I will emphasise an image in much the same way you did with your first example. But those who flip out skies; I call them ‘faux-tographers’ are damaging landscape photography as a medium. The first guy to reply, Mike, commented to say he’d taken a golden sunset that was assumed to be photoshopped. And that’s the problem, the ‘faux-tographer’ ‘cartoon-ographers’ have caused doubt over any impressive landscape image. On the rare occasions when a sky has been flipped and looks really good I have to wonder why the graphic designer – I can’t call them a photographer, much less an artist – doesn’t stand by his processing skills and explain what they did. If they’ enjoy flipping skies then they should be proud enough of their skill to admit it. But no they prefer to get the adoration of drooling fans suggesting ”You’re an amazing photographer”. As you mentioned flying elephants do not need explanation but a foreground taken at sunset and background at sunrise does. It’s a sham and as soon as I hear people do it without explanation I lose all faith in that persons skills no matter who they are. The fake double rainbow crowd get always get caught in the end. It’s pretty prevalent though. Often under the guise of “it’s art, anything goes”. A fascinating blog and a topic that I think about a great deal. Of course there are many genres of photography where the need for truthfulness and honesty is beyond dispute. Unfortunately with landscape photography it is not quite such a clear judgement call. Perhaps we have to accept that everybody’s boundaries are different, but I agree with you, when I look at a traditional landscape image, I want to be confident that it is a reasonably accurate representation of what was in front of the photographer. Although I’m not of the flying elephants school of photography, my multiple exposure images are certainly not truthful as defined above. I do manipulate my images but the structure and shape must have been captured in camera for me to have any success with the editing process. The question I ask myself time and time again is ‘does it even matter?’ My overwhelming feeling is that for the people who say they admire my work, it certainly would matter very much if it was suddenly revealed that my images were created either totally or partly in Photoshop. And I would really like to know why this should be. As I mentioned above, it clearly isn’t honesty (or at least honesty in the same sense) that’s the factor here, so there must be something else. The term ‘digital art’ has such a soulless ring to it – perhaps this is the reason. I wonder if it has something to do with the perception by the general public that as well as being dishonest Photoshop is a quick fix (I’m relatively unskilled in PS but I do know it’s far from that). Because I’m not concerned with depicting reality one might imagine that the endless considerations of such impenetrable truths is of no consequence. Unfortunately as evidenced by my tossing and turning in the wee small hours, nothing could be farther from the truth! Well said Alex ! There’s so much more to this that’s badly in need of filtering out into the ‘ non photography’ world. A casual glance at any online story about a great photograph and you inevitably have the same comments of ‘ Photoshop !’ from people who probably couldn’t tell you what part of the image was photoshopped or how . That chap who got that shot of a ferret or something riding on the back of a bird was immediately panned online as a cheat. It was easier and more acceptable for the layman to think it was faked rather than believe this chap chanced on a unique image. It’s something that I have experienced before online and have defended myself after admittedly taking a bit too much offence for my own good, but now I’m experiencing it on an almost daily basis and to my face ! Having opened a gallery of my work last month there is one particular image which I anticipated a lot of debate over. It’s a shot of a fantastic full moon setting over dramatic rocky islands of the coast here. It would have taken me perhaps 10 seconds to cut and paste a moon from any other shot into the pale twilight sky and achieve the same effect, but instead I had to wait three years to witness it and photograph it.. in the end with just one single frame. I don’t mind people asking me about the shot, because I know it looks surreal , but I’ve overheard people declare it to be a fake , glance over at me as if I’m the accused in the dock and then walk away ! The reason is of course because the vast majority of people who actually know very little about photography, know an awful lot about instances of faked photographs. Everything from Chinese propaganda, to covers of Vogue have all been highlighted in the media as cases where someone’s gone a little nuts with the clone tool. I can see from your blog and your replies back to Ignacio , that you’re being fairly diplomatic and fair play to you, but there’s so much ambiguity surrounding different levels of ‘manipulation’.. that far from accepting what can be done , I think we should reject it and do so strongly and start saying .. no that’s not a photograph.. it’s two photographs, or a manipograph !! A digigraph ! Part of the problem is the lack of vocabulary that can address the different areas.. when there’s the one pervasive word ‘ Photoshop’ that seems to cover it all. I was never much good in the darkroom.. and if I had a good shot that I wanted to include in a project or sell I would bring the negs to a printer who could extract an incredible range of tones and detail that I really struggled with. Ansel was a master at this and I don’t see what the difference is between having the craft or the tools to extract a great print from a flat neg.. and getting a good image from a raw file.. without materially changing the image. In most cases my work on my images is minimal and if I ever find myself scanning through a shoot to find some mediocre shot that I can ‘ make something out of’ then I have to snap myself out of that pretty quickly .. for me that feels like cheating myself out of an experience to go back and get it right. As for Ignacio and the pasted in skies, stretched mountains etc… all the references to historical composites are fine.. but most were presenting them as composites and not asking the viewer to believe the image.. travel photographers by virtue of their title are asking that.. unless they’re covering Lilliput ! Cracking article Alex. I have no problems with anyone doing anything they want to their images. The only issue I have is with misrepresentation. I always remember a wee comment by Joe Cornish about being a “faithful servant of the truth”. I’ve never described myself as such as I enjoy a fair bit of split toning in colour images. However, I always set myself wee rules – single RAW file, nothing cloned in or out, minimal crops (other than aspect ratio) etc. People just seem to expect that all of us are producing composite images routinely now and that bit annoys me. I’m always open about what I have done to an image and I only wish others would do the same. Couldn’t agree more. i do manipulate and composite but on the rare occasions that I do, I actually do label it , typically as an ‘Artograph’. For me, the acts of compositing, warping, distorting, perspective blending etc etc all create striking images but equally for me (emphasising the ‘me’ aspect) images which have utilised these aspects to achieve an appearance lose the inherent grandeur of experience. Not so long ago, I was a non photographer who became interested in photography. All of these striking images were ones I assumed were artistic representations of real scenes and they were inspiring. As time progressed and I found that more and more of these images were artistic interpolations of separate realities, it had a profound negative impact on my feelings towards those images. The artistic impact has never changed ; a striking image remains a striking image. What has changed is the empathy or the shared feeling that any given scene was actually experienced. The experience for me is key, the images the serendipity. There is a prevailing argument out there that ‘art is art’ and therefore anything goes. I like to think that landscape photography, if possible, transcends other forms of art in that there is equal appreciation of planning, effort and even luck relating to the final artistic product. If I produced two equally striking images ; one from recording amazing light at an amazing location and another recording amazing light at a separate location, there’s no doubt that I would prefer the first. I couldn’t agree more Dylan. Actually your images are a good example of just how far you can go with ‘normal’ adjustments and still retain that strong connection to reality that I feel is so important. Thanks for the comment. Fantastic article and a nice, fresh take on a classic debate. Tastefully done, without degradation or bias on either side. I think there is a place for both, but I also agree that people “trust” photography less and less because of the prevalence of heavily manipulated images. BTW, I really like the level to which you enhance your images…my tastes fall more on the side of realistic, but enhancing contrast and color to make the image felt like it did when you saw it with your own eyes. Great stuff. Cheers, Alex. Thanks Jeff, your processing is very tasteful. As to my own…there are a few images I would probably dial back a little now! Great article Alex – as well as dabbling in a bit of photography, I also work in the visual effects side of the feature film industry. We are always making make believe scenes look believable, and a lot of that comes from the matte painting department, who use similar techniques of sourcing various photographic elements like skies and mountains and creating a believable scene to the directors liking using photoshop. Matte painters are very skilled artists, and I have a lot of respect for them. I guess this is similar to photographers mashing together elements making a scene to their liking that will hopefully wow the world. I don’t really see an issue in this, as it is art and their vision. I do however have an issue when they are attempting to pass off their ‘art’ as a real scene captured in the moment, and being very deceptive about it. Large moons and milky ways added to scenes which would usually be an impossible shot is one of my biggest pet hate, as is adding lighting and atmospheric effects to take that ordinary photograph to next level art. I’m not talking about processing here, but actually adding and replacing things in shot. Thanks to my day job, I’m lucky to be able to usually tell a manipulation, and some of these are done very badly BTW, but even so, a lot of the general non photographic community can’t tell, and this is giving them false expectations. I’ve lost count of how many times someone has sent me what they thought was an incredible photograph, only to have me tell them the truth, that it was not all shot as advertised. I love the thrill of going to the trouble of actually planning a shot and getting the satisfaction of when I pull it off, however a lot of my photos have been labelled as simply ‘photoshoped’…I guess I do get a little offended by this, especially after the hard yards I put in to get the shot – but then again maybe it’s really a compliment…I’m from the keep it real camp and proud of it! I sympathise Mark, there is nothing more frustrating that being tarred with the same brush. Unfortunately ‘Photoshop’ is synonymous with the work ‘fake’ in the eyes of many, so as soon as you say you have made any adjustment you’ve lost! Echoing the others – a great article Alex. I am a fan of your work and Ignacio, amongst many others. I have loved landscape photography and have travelled considerably to capture images but, silly me, apart from basic post production I have not added skies or enlarged mountains. I feel that I have some beautiful images in my portfolio – both close to home and from my travels, but they pale in comparison to images I now discover are just not “real”. It also creates very unrealistic expectations for others who travel to these places but just can’t get the scene to work. Something is just not quite right. I am so glad I travelled Patagonia before it became a mecca for the latest flood of photographers – there was no benchmark to aspire to. Same for my first trip to Iceland. I do less landscapes these days and am developing my skills in other genres and that’s a good thing for me. The problem also is compounded by the fact that what a camera captures may not be real in the sense that it doesn’t mirror our visual experience of the world to start with: it can’t match the Dynamic Range of your eyes (without any manipulation whatsoever); it may capture detail that we could never resolve with our eyes; we may not interpret the scene for what it was in reality ( ambiguous slices of time), mono images are often heavily vignetted ‘artistically’ and have tones that emphasise the experience of looking at tonal richness, rather than offering literal representations, colour blind people may have a different expectations of non-colour-blind people of colours in a photo: so the question of what is ‘real’ starts off on pretty rocky footing; a camera actually uses filters etc to make the image as near to the norm as possible but it never was ‘real’. Before digital, Jerry Uelsmann, Man Ray etc were doing things in the darkroom that were obvious manipulations, but so to a lesser degree were all mono and colour workers, digital has just made it easier.So to those that say ‘any’ adjustments make the image ‘fake’ are barking at the moon for the sake of it, no photograph is EXACTLY ‘real’. I think it boils down to the question what are we trying to achieve? Great article Alex, only just come across it. I agree 100% and have said as much before myself. This week I had a recent, very minor success in that an image of mine was shortlisted in the UK National Parks 2015 photo comp and I posted all 9 shortlists (inc the winner) on Facebook. One comment to that post was ‘Stunning shots and processing!’ so I replied with a link to this article after stumbling upon it after a Google search. Not that I was unduly annoyed by the comment but Photoshop clearly has something to answer for, especially its perception among the wider community. PersonaIly, I don’t mind what folks do to their photos as long as they don’t set out to deceive. To me, an image where a fake sky has been added is not honest, unless this is clearly stated or revealed in some way. If not, I regard this as deliberate deception, pure and simple. Conversely, a RAW file (digital negative for anyone who doesn’t know)) has to be edited or ‘processed’ or it would NOT represent anything like what we saw when the shutter was pressed. There is no choice in this matter and it’s a natural, integral part of taking digital photos. Abstract photography (for want of a better description) such as Valda Bailey’s work (which I saw recently at Southwell Minster, Master’s of Vision) is clearly NOT a deception, there’s a massive difference between deliberate and obvious digital art and digital manipulation when used to replace an otherwise poor element of an image and, by doing so, deceive. A while ago I was involved in a little Twitter spat with some huge US digital photo company (can’t recall the name) who posted an article about swapping skies using PS. I tweeted back one word ‘Cheating!’ and that got me into a spot of bother for a short while and I found myself questioning myself over the subject later. I wondered whether mine was a lone voice on this subject and am very grateful to find that it looks like I’m not. For the record I use LR6 and single RAW images (99.9% of the time). Interesting post Alex. However having looked through your images I have found many that have been clearing manipulated beyond the realms of the real. This one in particular caught my eye. http://www.alexnail.com/latest/rainbow-and-lenticulars/ and http://www.alexnail.com/latest/entujokull-glacier/ where the position of the sun (calculated by the angle of the shadows – side lit at an angle roughly 90 degrees to your position) wouldn’t allow you to see a rainbow from your camera position. It would be my professional opinion that you’ve photoshopped in rainbows to add drama.. which is a disappointing considering how you’ve written your article, and the write-ups for the image. I could pick apart a good number of your images, and being a lecturer in physical, dynamical and applied meteorology I’d like to think I can offer an expert opinion on the subject, certainly as far as this thread is concerned. I’ve seen examples of your work where skies are clearly photoshopped in, and I’d even say the odd milky way or two (based on the metadata dates of your images and direction and altitude of the Milky Way). You’re obviously a talented photographer, but you’re just setting yourself up for a fall with your incessant preaching of photography ethics and lambasting other photographers on their processing practices when really you are guilty of all of the points you’ve raised in your article. I’d be interested to hear your view on this. As I said, this is only my opinion, so I’d welcome your responses. I’ve approved your comment because I would hate to be accused of covering anything up, but really you are a bit out of line here. Perhaps that is why you failed to provide an email. I’m going to reply on the basis that you’re trying to ‘troll’ me! It’s somewhat convenient to refer to yourself as an expert whilst hiding behind a cloak of anonymity! (You provided no email address) That alone makes me question what you say. But let’s assume you are an expert…all I can say is that you are wrong on all counts. I have never composited and I never will. The only things I have ever even cloned out have been transient (a car, a leaf etc). So I’ll have to just read your comments in the vein of an expert who needs to go back to school. Ultimately I take an honest approach for me and perhaps the approval of a select group of peers. I don’t benefit from it at all in any way, so ultimately your opinions on my photography are moot as long as you agree with the argument. A fascinating exchange of views – thank you for initiating it. I should start by saying my own position on this is very close to yours. I have often played with the exposure and contrast of a sky to enhance it, but I would never paste in “another” sky. I might remove a telegrapph wire that I genuinely can’t avoid. I might bracket exposures and combine them to give me an improved dynamic range, but I would not combine exposures from different times or days. I think the exchange above pretty much covers the “truth” debate. What occasionally irritates me is when I show someone an image I’m pleased with (it happems occasionally!) and they – probably not a photographer – say “Bet you photoshopped it.” I’m weary of this – I’m actually a fan of Lightroom and don’t use Photoshop much at all. Of course I used Photoshop/Lightroom – to make the most of the RAW image I’ve captured. It’s not as if Ansel Adams handed his unexposed films into Boots (or whatever his local equivalent was) and accepted what came back. I’m making no comparisons beween me and El Maestro, but today, just as in the darkroom days, we all need to have some level of competence in editing our images to make the most of them. But it does not mean we have somehow “cheated”. I really enjoy your images (and blogs) Alex – they’re inspiring. Keep it up. I love your work and can appreciate the quality of your images because some are ones I have tried to capture myself, especially on Dartmoor with limited success. I am happy to process my images and sometimes quite dramatically. 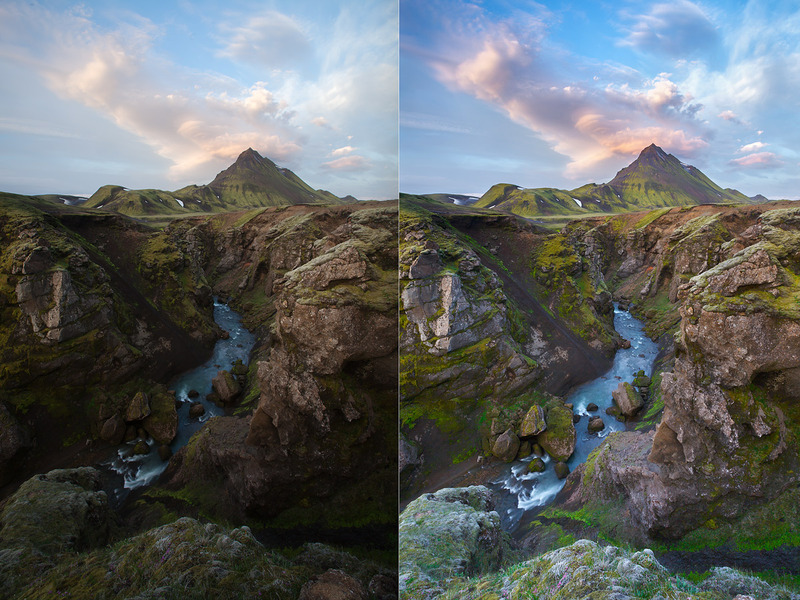 I do however generally only process what is already in the picture, merge hdr files or panoramas. I don’t mind cloning out minor distractions when it isn’t possible to do so by adjusting my composition. Some people go much further, and the results can be fantastic. I love to look at some of these images but I find that sometimes if you don’t realise they are not totally accurate in more than just tonal and colour, you can find yourself selling yourself short because you can’t get the same results honestly. The other thing is that once people lose trust in images being genuine the ones that are real are assumed to be faked too. This is something that I find a bit sad, especially if I have driven on a 100 mile round trip for example to get an amazing Dartmoor image and witnessed a fantastic moment in light. I don’t know what the answer is though, Neither approach to the art is wrong however I wish people would label what is real and what isn’t more. But if people do that will they be worried that people may think that they aren’t as good a photographer? Making some of these surreal images can be just as much of an achievement and take a huge amount of skill. To the non-photographer who may like to look at these images, or hang them on the wall, I can only imagine that they just don’t really care. I fear that with people only caring about the final product; especially non-photographers the issue will only get worse as people try to do more and more to stand out against everyone else. Hey Alex, I totally agree with you! I have had a conversation about this theme often in the past. For me, there is Photography and Digital Art. If you capture 3 Bad images which all look crap if you show them, but look pretty cool merged (like sand/water/sky) then its digital art. Because the single Images still look crap. You can create woooondeerrrfuull Images which are being enjoyed by the majority of people, but if they are crap Single Exposed, then its digital art. Thats why I use Lightroom only. I dont even have photoshop. But I am relatively New to photography but traveled a lot so far. Best regards and looking forward for your work – Jonas Mehmood. Thanks for your blog – I came here after reading your comments on the 500px article. For me, landscape and nature photography is about sharing the beauty (and the wildness) of nature and the land, and the emotions I feel about it. I’ll set off at whatever hour I need to in order to be at a certain place at the time I think will work for certain weather conditions. Its about knowing your landscape intimately, studying how the light illuminates and interacts with the land and the weather (our Scottish light is incredibly dynamic and fast-moving). I used to work in a darkroom, where of course you adjust contrast etc to produce a certain result. As has been noted above, RAW files must be processed (or interpreted) in Lightroom or equivalent to produce any kind of image, this is the same in my mind as we used to do in the darkroom. We adjust contrast, saturation, curves, levels etc to get the best out of our digital ‘negative’. There is also a great variety of images that can be produced even in-camera by different makes of camera and by the different presets available (landscape mode, etc). Its all subjective as to what is actually ‘real’ – and I’ll happily accept that a ‘real’ photo may well be dull. If you’re calling yourself a photographer rather than a Digital Artist, then adjusting contrast and tone levels to get the best out of a rainbow or a beam of light is absolutely fine. I find creating an artificial beam of light, adjusting the mountains, to be distasteful (unless clearly labelled). If you need the mountains bigger then use a different lens or walk a few more miles to get a better perspective. One that reflects your vision and integrity. I’ve just read a number of your articles but found this one particularly interesting. My relatively recent interest in serious photography was catalysed by the amazing imagery that you see everyday in magazines and on websites such as yours. I was in awe of the skill required to produce some of these shots but quickly became frustrated at my inability to deliver anything comparable despite having the ‘best’ camera and the ‘best’ lenses. However I quickly found the solution to this problem was Photoshop. It allows an amateur like myself to take an “ordinary” image and with a few tweaks here and there produce something that when uploaded to 500px or Flickr will generate the same awe in others as I felt originally. I’ve since realised you don’t even need a camera – you can achieve much the same with an iPhone and Instagram…. If only every skill in life was so simple to master! I do agree with you. There is a quantum difference between “processing”, which is the equivalent to what film photographers do/did in the darkroom, and “manipulation” where digital photographers add, subtract and generally concoct images at their computer. Photography has always had an umbilical link with reality; this is lost once a significant level of manipulation takes place. I expand on this idea in my blog; forgive me if I post the link to it on yours! Many thanks, and well said. Its a very complex subject. Sensors are not perfect they do not see faithfully what we saw they are an approxamation. Manufacturers are limted by colour filter arrays when using bayer sensors and so adjusting saturation, contrast, exposure in parts of the scene etc is in my book perfectly legitamate as is a degree of sharpening. I always use the bare minium I dont even like dodging & burning in Lightroom so rarely ever do. Screens, compression, printing, paper all affect what people view but adding things that were not there or distorting what was there beyond that added by lenses is in my humble opinion not representative of what we saw in landscape. In other spheres like food, fashion etc. I have less of an issue for those companies that want to present a compelling reason to purchase and pay photographers to produce such images otherwise they are commercially disadvantaged. Absolutely Jeff, we are in agreement that some degree of editing (whether in camera, on computer or otherwise) is absolutely necessary. Taking/adding/distorting subjects is a whole different can of worms though as you say. I’m also in agreement that for commercial use there are plenty of cases when heavy editing is totally acceptable if that is what is required. Thanks for the comment. Hi Alex, I’m about 8 months late to this conversation but I just wanted to say that your article is spot on; it’s a topic many of us landscape photographers think about often and you’ve addressed it perfectly. Back in the summer of 2009 I traveled to Norway and the Lofoten Islands, which weren’t so popular with photographers then as they are now. I had only seen one professional photo of the islands prior to my trip; the photo was of an ultra pointy spire towering over the bays and fishing village of Reine. When I actually got there in person, my first and foremost thought was: oh, that f-n photo was so faked! The photog stretched out the peak big time. And why? The mountains there are already so impressive, why did that photog feel the need to fake it? Some kind of inferiority complex? I totally lost respect for that guy and his faked photo. I think there’s a lot of correlation these days between landscape photography and fashion photography, in regards to how much our “models” are processed, manipulated, and idealized. Fashion photography has been widely criticized by how models are post-processed to such a degree beyond reality that it leads to unrealistic expectations of beauty, expectations that no man or woman could ever live up to, not even the actual models! So it goes with “nature” photography, where photographers are creating and faking these scenes that have no basis in reality, yet are presented as real scenes. I guess it all comes down to taste. Like you, it is important to me that my photos maintain that connection to reality; I’d feel way too much like I’m lying to my audience if I presented all these fake scenes as if it’s the real thing. Hi Jack, it’s great to have you comment. You are one of a select few photographers that I can guinely say have inspired me to go somewhere (in this case Lofoten). I went in 2012 and at the time you were the only landscape photographer I could see who had done some serious hiking out there, I was sold on the idea immediately! Agree very much so, Alex. My processing taste probably falls slightly lower than yours in the scheme of strength but your images are clearly real; most of the things I see on Flickr (if I can stomach it) are way overcooked for my taste. The general public clearly are onto the scent as I get asked if I edit/process mine, even ones with minimal processing. Of course the answer is yes – you need to – but I’d be happy to show someone the RAWs if they really wanted to (they’d much prefer the finals!). I’d never even considered stretching mountains in PS or any such thing – at first I was surprised to hear of it but now I’m surprised I didn’t think it would happen! I’m not sure where the field is going but something will have to give – maybe we’re just in a peak of processing fever because of the availability of great tools and great sensors these days and it will swing back towards natural in due course. Thanks very much for the talk last night at Gwynfa, some fantastic images and an inspiring talk, thoroughly enjoyed it. As for the comments about faking photos, I’m with you and your mate Mark! We have to change levels and carry out tweaks to get the image we want, but so long as you can recognise the place and scenery from the image then I believe you’re not far wrong. After all photography is a representation of reality. Our brains are highly advanced in ‘seeing’ Sometimes a photograph may need a little help in matching our brains resolution and which have evolved over thousands of years to get where they are today. Thank you for your article Alex. May I add a few points to your nice discussion? 1. 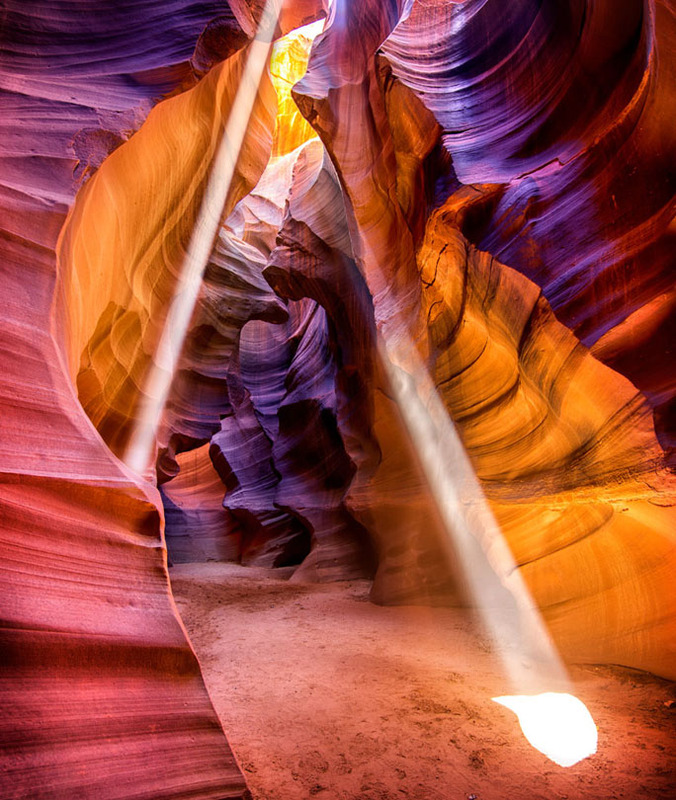 One more facet is “fake” with Ignacio’s Antelope Canyon image that he did not disclose. Light shafts only appear when someone tosses dust into the air. Guides typically offer to help photographers by tossing dust for them. 3. Ansel Adams (a former neighbor and acquaintance of mine) used a strong red filter to achieve his deep dark black sky for his famous Moon and Half-Dome photograph. PS Glad you rebutted the fellow who claimed your rainbow images were faked. Well, I’m also a physicist with some expertise in rainbows and their angles – and his arguments failed. It is difficult to measure sun direction exactly, but I am fully satisfied your rainbows are in roughly the right place for the direction of the sun.